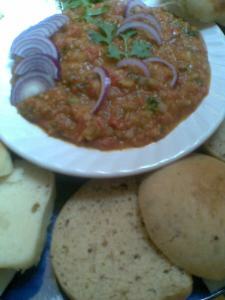 Pav bhaji is something which comes in the category of comfort food for many of us, and like most of the popular foods which have survived the test of time and have been popular as fulfilling street food, aka, pizza, burgers, vada pav and litti chokha, this was also a poor man's food when it was not marketed in the way it is done now. 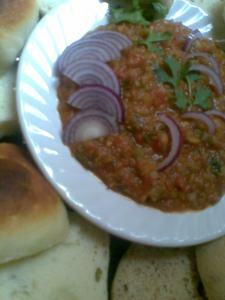 You find pav bhaji masala mix so easily and the pav is always on the shelves of local bakeries. Not to forget every street eatery serving this as a filling meal which most people find suitable for 'anytime meal'. There is only one problem with this yummy delight when you are enjoying it in the original form, it is soaked and drowned in butter. The pav is literally fried in butter and the bhaji has a generous topping of butter over it, so much so that when the plate arrives in front of you, it has a pool of butter over the bhaji which overflows and drenches the already drunk pav. To tell you the truth, I am grown up loving that version of pav bhaji, but now as a sedentary lifestyle and an ageing body, I can't handle that much heaviness in my pav bhaji. 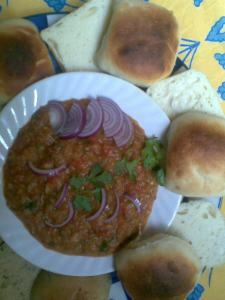 When I started making my low fat version, read butter less version of pav bhaji, I realised the buttery version is so overpowering with all things butter that the real taste of the bhaji and natural softness of bun is overlooked, at least in the north India eateries where I have had pav bhaji till date. I know you wouldn't believe me, but once you eat this version, you'll stick to this whenever you make at home (will tell you more reasons to do so), and many people even don't realize it has no butter, until I tell them. The flavors are so rich that butter is so easily forgotten here. 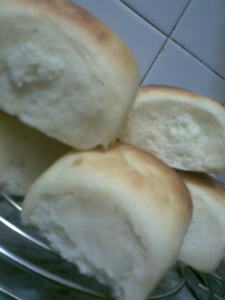 and though I have been making many breads with all the healthy flours, I had never made a white bread, thinking it is so easily available in the market. Dough was made using all purpose flour (300 gm) with 1/2 tbsp of fresh yeast foamed or proofed in 50 ml of warm water and sugar solution. 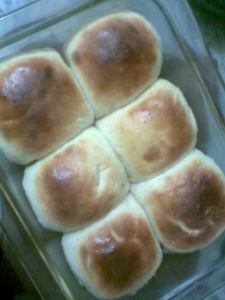 1.5 tbsp of fresh homemade malai or cream and just enough warm milk to knead a soft and silky dough. Rest the dough till it doubles, punch and knead again to make it more soft and silky and let it rise again once. When doubled, divide into 6 portions, make smooth balls and keep in the greased rectangular bowl as stated above, wait till balls double and bake in preheated oven till cooked. The bhaji is even more special. I make it with many combinations of veggies but this pumpkin bhaji is my favorite, as it is loaded with fiber and all the antioxidants, AND it is so yummy. bay leaves dried chopped with a scissor 10 nos. 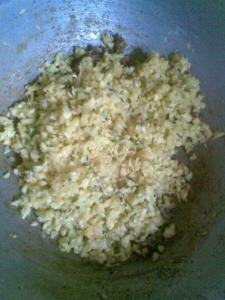 Process the ginger garlic and onion together in your chopper or processor OR make a coarse paste in mixie.. 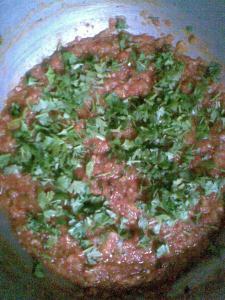 Meanwhile process the cubed pumpkin pieces into a chopper and throw into the kadai when the masala gets fragrant.....add salt to taste, mix well and cook covered for 5 minutes or so..
Oh, my mouth is watering now...will definitely try this pav bhaji recipe.Your blog is just great! I love it. Adding pumpkin is really new. 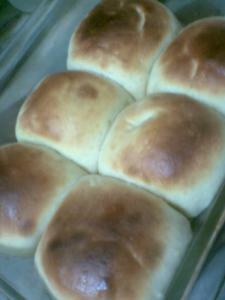 Like the idea very much, very nicely baked pav bun. The whole dish is new to me and the pumpkin is a definite highlight. I've got a list started for what I'm going to make as soon as I get into the kitchen and this is going on it. 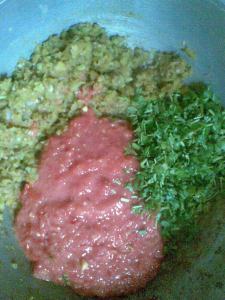 I want to start experimenting more with Indian foods and your blog is such a great resource! thanks Saroj for your generous comment..
thanks Sakshi...you have to take a lot of butter with this pav bhaji , you need to put on a lil' wt. ASAP. Magia ..thakyou for such a generous comment and for taking interest in this cuisine..
thanks Notyet....yes i feel very good when i make a healthy n yummy meal...how good it will be if we shift the feel good emotions from those cakes n brownies n halwas n pooris to such healthy yummy things. thnks Lori and tell me if you try this...i am sure you'd love this. 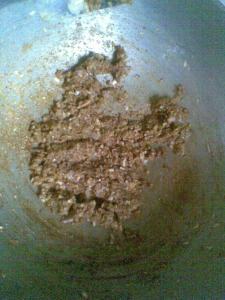 thanks Spice...yes it's very easy n yummy.. Wonderful Recipe ! Looks Awesome ! And one of the tempting recipe for me :)adding pumpking sounds gr8.Nice presentation with yummy pics. Wow ,yoe are right. 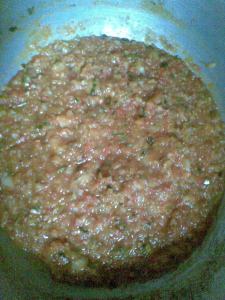 Pav Bhaji looks delicious and mouthwatering dear:). 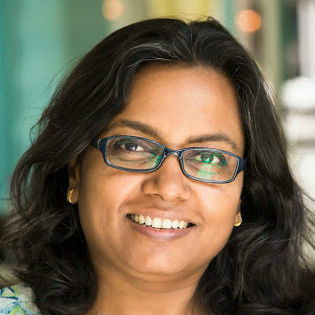 U r having really a nice blog,Sangeetha.really great post.I am always in search for low fat healthy and tasty food recipes.THanks alot for this wonderful recipe.